Dauvergne, P & Lebaron G. . 2014. 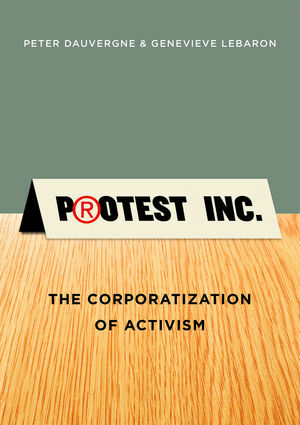 Protest inc. - The corporatization of activism. Cambridge : The Polity Press. 206 p.
Peter DAUVERGNE : professor of International Relations and Director of the Lui Institute for Global Issues at the University of British Columbia. The corporatisation of nearly every aspect of existence has long been documented and critiqued, but what has happened to those aspects of social and civil life that involve sentiments not immediately compatible - on the surface of it - with the more ruthless end of market values? Here we could include protest, dissent and opposition but also altruism, philanthropy and selflessness. This useful and descriptive book looks in detail at the ways in which activism, from its spikier end to its gentler, more reformist aspects, has not only been co-opted by the market, but also how activist movements and charities have themselves internalised market values. ‘Over the last two decades,’ the authors begin ‘activist organisations have increasingly come to look, think and act like corporations’ (p.1). Anyone who’s ever been involved in a small political campaign where money is non-existent and people volunteer their time for free might baulk at the authors’ suggestion that ‘many activists are now defecting to the winning side’ (p.155) or that ‘activism is less “radical” than it was forty or fifty years ago’ (p.4), and it is clear that in the main the authors are not talking about the underground end of activism - anarchist groups working on prison abolition, for example, or more spontaneous political actions. The authors are careful in this regard to distinguish ‘grassroots’ activism from ‘NGO’ activism: the book’s focus is mainly on the latter, though it also seeks to describe a general trend whereby a combination of state repression, the privatisation of everyday life and the disintegration of social networks has led to a combination of widespread fear of the consequences of speaking out with the infiltration of corporate capitalism to every sphere of life. What all this means is that radical activists, ‘those who challenge political and corporate authority and call for structural change to alter the outcomes of markets and policies’ (p.26), have been marginalised and assimilated: either rendered ineffectual or dispirited or sucked up into the relentless corporatization of contemporary activism. Quoting Warren Buffett’s infamous point - ‘there’s class warfare all right, but it’s my class, the rich class, that’s making war, and we’re winning’ - the book paints a dispiriting picture of crushed radicalism and its replacement by hegemonic big-brand campaigns. The authors point out that previously unthinkable activist alliances, ‘partnerships with big-brand companies - Walmart, McDonald’s, Nike - are now common, even expected’ (p.1). The impact of these corporate agendas on activist work is perhaps predictable: ‘the agendas, discourse, questions, and proposed solutions of human rights, gender equality, social justice, animals rights, and environmental activist organizations increasingly conform with, rather than challenge, global capitalism’ (p.3). It is in the details that this book really excels, and in many ways it is more useful as a series of well-researched facts about the ways in which corporations have subsumed activism and how activism has become more corporate and tepid rather than as a more theoretical argument as to how and why this has happened and what can be done about it. The authors’ definition of ‘activism’ itself is loose and at points a little too imprecise: ‘Activism, as we define it, includes protests; yet most activism emerges out of and takes place between protests .... Activism requires sustained collective action with a political purpose’ (p.7). This broad definition allows the authors to include everything from the World Social Forum, to nature and ecological groups such as Greenpeace, cancer charities such as Komen for the Cure (who cut an unpalatable deal with KFC) as well as Amnesty International and human rights groups. The authors admit this definition has its potential downsides as it ‘softens the meaning to embrace groups that accept, and in some cases are even part of, prevailing power structures’ (p.8), but the breadth of the definition does allow them to point to broader tendencies and trajectories in the story they tell about corporatization, while avoiding getting bogged down in fine details about which groups are ‘revolutionary’ and which ‘reformist’ for example. But carving out the differences and crossovers between NGOs and charities, political campaigns and health and environmental projects would have generated some interesting tensions, particularly around question of nation states and global enterprises - are charities such as Greenpeace multinationals in the same ways as corporations? How do activists from these groups deal with asymmetrical state repression in different countries? Are NGOs and charities dealt with differently than more confrontational activist groups? While the authors devote an important chapter (‘Securitizing Dissent’) to looking at the ways in which states around the world have cracked down on protest in the past twenty years, it would have been useful, and more directly relevant to the overall argument, to have covered in more detail the relationship between, for example, police spies who simultaneously inform on activists both for the state and for corporations, as well as to examine what happens to those activists who directly challenge corporations - the decade-long UK Mclibel case, for example, in which the state, police and McDonalds colluded to undermine activists from every possible angle. Nevertheless, the facts here are certainly convincing and the authors make a good, if highly depressing, case for the de-radicalisation of activism and the rise of institutionalised ‘causes’: ‘Who, fifty years ago,’ the authors point out, ‘would have thought that one day most of the world’s human rights and environmental activists would be marketing causes and reporting back to corporate donors?’ (p.109). Discussion of the links between the ultra-rich and philanthropy are particularly useful in laying out the financial stakes as well as the ‘need’ for activist groups to engage in branding and marketing, as is the brief history of fair trade in the overall picture of market-driven ‘good’ consumerism. The authors succeed in presenting a coherent, convincing picture of a stifling and widespread tendency which more than achieves its overall goal of sending ‘a warning shot across the bows of corporatizing activism’ (p.156). Dr Nina Power is a Senior Lecturer in Philosophy at the University of Roehampton, London. She is a founding member of Defend the Right to Protest, formed in the wake of the police violence and mass arrests of the UK student fee protests of 2010. How can political activism make more of an impact? In Protest Inc., Peter Dauvergne and Genevieve LeBaron argue that the corporatization of protest has left us today with little more than an illusion of activism; one that serves citizens’ restless desire to do something (albeit on their own terms), but one that ultimately fails to get to the root cause of most global problems. This is an angry, frustrated and pessimistic attack on the current state of protest and activism, writes Alex Hensby, but what we are to do about it, nobody seems to know. Provocative reading for readers interested in protest politics and the future of NGOs and social movements. Protest Inc.: The Corporatization of Activism. Peter Dauvergne and Genevieve LeBaron (eds.). Polity Press. February 2014. The past few years have been an interesting time to be studying social movements. Between 2010 and 2012 we saw the Arab Spring, anti-austerity protests in Greece and Spain, student protests in Chile, Canada and the UK, and the rise (and fall) of Wikileaks, not to mention the global Occupy Movement. This upsurge has inspired many scholars to study the new tools of dissent at activists’ disposal. Recent publications by Manuel Castells and Paul Mason, among others, have emphasised the power of fast and fluid organizational and communication networks aided by open source communications technologies. Although these authors are usually reluctant to try and write the recipes for the kitchens of the future, they at least find cause for optimism in activists’ ongoing struggles against state repression, and the neoliberal mantra of ‘there is no alternative’. Given this context, it might seem a surprise that in their assessment of the contemporary health of global social movements, Peter Dauvergne and Genevieve LeBaron should produce such a relentlessly gloomy and pessimistic book. In Protest Inc.: The Corporatization of Activism, the authors posit that that we are seeing not only a trend towards the corporatization of state politics, but also the corporatization of protest. This can be most clearly seen in the way advocacy groups, NGOs, and social movement organizations (SMOs) increasingly pursue partnerships with the very corporations they are supposed to be opposing. At the same time, grassroots movements have come under renewed pressure from what the authors call the ‘securitization of dissent’, with states authorising militarized police tactics against protesters. In this sense, Protest Inc. reflects global capitalism at its most pernicious – pressurising activists to fall within its slipstream by providing benign remedies to the world’s problems. Of course, the authors argue that such remedies do not challenge what has become a crucial blind-spot in the corporatized activist purview, namely global capitalism itself. The book draws on a mixture of old and new themes. For many political scientists, discussions of individualization and declining social capital (chapter 4), and the institutionalization of activism organizations (chapter 5) will already be familiar, even if certain key studies – most notably Jordan and Maloney’s similarly-titled The Protest Business? – are oddly absent. Certainly, the book brings these discussions up to date: whilst NGOs and SMOs are traditionally mindful of accepting direct funding from corporations, the authors show how intermediary initiatives and foundations (such as the Global Fund to Fight AIDS) allow funds to be transferred more covertly. Much is also made of the increasing number of corporate executives on NGO boards. Perhaps most controversially, Fair Trade logos have started to appear on a range of unlikely brands such as Nestlé and Starbucks. Whilst some might see this as reflecting a shift in corporate practices towards ethical trade and sustainability, the authors contend that in awarding these moral kite-marks Fair Trade’s capacity to publicly criticise these corporations’ more nefarious practices has been fatally compromised. Although the authors’ critique of NGOs and SMOs is generally convincing, its framing can sometimes be problematic. It is implied throughout the book that the deepening relationship between corporations and global civil society effectively represents the co-optation of the latter by the former. Although many activists feel queasy about the way certain corporations express their ethical credentials (such as the vomitous claim by one that investing in the poor ‘isn’t a social issue; it’s smart economics’), I would dispute the implication that all NGOs or SMOs are guiltily compromising their ideals by linking up with corporations. In fact, many have always seen capitalism as part of the solution rather than the problem, and would see no cognitive dissonance in, say, KFC supporting awareness campaigns to fight breast cancer (p.45). Many would also defend the real, tangible gains made through fair trade and eco-labelling policies. So rather than being simply a question of co-optation, I would argue that this instead reflects longstanding differences between liberal and leftist voices within global civil society about what this sphere is and should be. Consequently, this book poses a serious question to the reader: do we want NGOs and SMOs working with corporations to pressurise them into changing their values and practices, or should these groups retain a critical independence? The authors argue in favour of the latter, reflecting this book’s quietly radical politics. Of course, the authors might argue that claiming a critique of global capitalism as ‘radical’ is symptomatic of the very problem we presently face. Such a critique was at the core of the global Occupy Movement, but Dauvergne and LeBaron do not share the optimism of many authors on this subject. As they argue in chapter 3, grassroots movements have been increasingly trampled into the dirt by securitized policing policies. The authors trace the securitization of dissent back to 2001, finding that states have made use of anti-terrorist legislation to crack down on protest through ‘command and control’ policing. This has led us to a deeply alarming present situation where the head of Russia’s presidential administration can cite European and North American governments’ use of water cannons, crowd kettling, group surveillance, and pre-emptive arrests as examples of ‘best world practices’ for policing protest today (p.69). Depressing though it is to read, this topic perhaps represents the book’s strongest contribution. Aside from its subjugation at the hands of securitized policing, the Occupy Movement is afforded relatively little detailed analysis in this book. This is surprising given that for many activists Occupy represented a real organisational alternative to the corporatization of NGOs and SMOs. Admittedly, references are made to the movement’s ‘drifting priorities’ since 2012, with its constantly-evolving network structure considered too fragmentary to sustain any real influence. This raises the question of whether the authors believe that some level of institutionalization can be a good thing, not least because they argue that corporatized NGOs and SMOs are otherwise left largely unopposed in claiming to speak on behalf of global civil society as a whole. Although Dauvergne and LeBaron are keen not to dismiss the piecemeal gains of NGO and SMO campaigns, they conclude this book by arguing that we are left today with little more than an illusion of activism, one that serves citizens’ restless desire to do something (albeit on their own terms), but one that ultimately fails to get to the root cause of most global problems. For this reason, this book should perhaps be read as a polemic – an angry, frustrated and pessimistic attack on the current state of protest and activism, especially the corporatized institutions of global civil society. One suspects the authors would like their anger to inspire greater critical reasoning, research, and protest action from its readers. This is no ignoble aim, though having read this book I am left wondering where on earth this should take us. Alex Hensby is a final-year PhD researcher at the University of Edinburgh. His thesis focuses on participation and non-participation in the 2010/11 UK student protests against fees and cuts. He previously taught sociology at Roehampton and Cambridge universities, and is the co-author of Theorizing Global Studies (Palgrave, 2011). He occasionally tweets at @alexhensby. Read more reviews by Alex.